Food photographer and award-winning blogger Béatrice Peltre brings together a delicious array of recipes in her cookbook, La Tartine Gourmande. Based on her blog by the same name, Peltre’s book is a lovely blend of personal reflections on cooking and food, delectable recipes, and vibrant color photographs. As she states in the introduction, “whenever I walk into my kitchen, I am inspired to try new things and prepare more beautiful healthy foods.” Readers of this book will feel the same way. conversation at family dinners. Already cooking cakes and other desserts at the age of eight, Peltre became known as “the French girl who travels, cooks, and talks about food all the time.” Although a restaurant was once a dream, the author discovered her true joy of cooking came from creating healthy foods to serve to her family and friends. Drawing on her French heritage, Peltre demystifies French tartines, (open-faced sandwiches), tians (layered vegetables baked in a slow oven), and galettes (savory crêpes made with buckwheat flour), along with clafoutis, soufflés, and papillotes. She expands the repertoire of recipes to include pasta dishes and risottos, frittatas, and simple to elegant desserts. Of almost equal importance to the recipes are the artful photographs found throughout the book. Peltre’s sense of color enhances each dish, whether a simple zucchini salad or spaghetti tossed with fresh corn, crab, peas and cherry tomatoes; the brilliant colors of the food play against complementary backgrounds, providing a feast for the eyes. 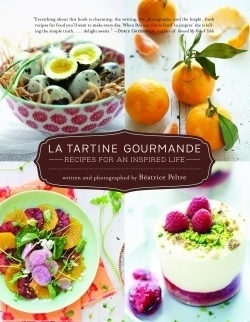 As much an art book on food as a cookbook full of intriguing flavor combinations and delightful personal stories, the reader may be hard pressed to decide whether La Tartine Gourmande deserves a place of prominence in the kitchen, or an open spot on the coffee table in the living room.